All my life I have been told the importance of education. Much of that pertained to the desire my parents (and grandparents) had for me to attend college. 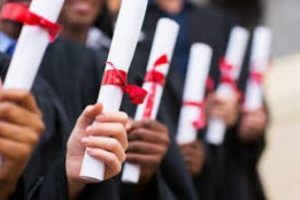 Obtaining a degree from an institution of higher learning was a much sought after job requirement. Primary and secondary education will give you the rudimentary skills to wander through the world. They teach you how to add, subtract, multiply and divide. They teach you how to read and write. Continuing education teaches you how to focus those skills for the job you want. It is specialized education for your career path. However what about beyond that? I graduated from Millersville University with a bachelor’s degree in education. In the number of years I have been out of school, textbooks within the classroom have been rendered all but obsolete. Handwriting is no longer taught in schools whereas I was tested on my penmanship; both on the chalkboard and on a piece of paper. Even mathematics is taught differently. Everything is computerized. Smart boards aid in teaching and assignments are emailed. We even read current periodicals online versus meticulous scanning through backlogged microfiche. Today, education is predominantly about staying current. It doesn’t bode well for one to remain stagnant in an ever-changing world. Even in an established career, growth will always be required to expand your skill set. Hairdressing is one such example of this. Fashion is a fickle and flighty industry and hairdressing is a major part of it. Color, style and cuts that were popular five to ten years ago, are no longer relevant by today’s standards. Even the way we hairdressers communicate and consult with our clientele has changed. We no longer use magazines but online apps such as Pinterest and Instagram. We can even search for particular looks and colors simply by typing in a hash tag to display numerous examples of the same styles of work. This constant change means we can never rest on our lapels for long. Continuing education is a MUST to stay cutting edge (hahahahaha) in our field. Here at Salon Enso, we are required to take a minimum of three continuing education courses within a calendar year. This keeps us fresh, sharp and keen on testing out new techniques and tips. Several such classes are offered with the salon serving as a home base and others we travel for. 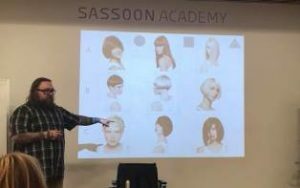 Last month the owner of Salon Enso, Darcy and one of our extraordinary stylists, Kelly traveled to Chicago for a 5 day cutting class at the Vidal Sassoon Academy. 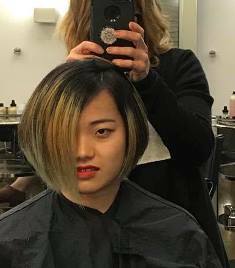 Sassoon has very high admiration within the styling world, especially for cutting. The shapes are clean and ultra-precise – perfect for even the most seasoned stylist to test their skill set. One of our fabulous stylists Molly and I teach introductory styling and coloring classes to other Aveda salons in the area. Even though I may be there to educate other stylists, good discussion often ensues within the class and I find myself learning from my students as well. I love seeing light bulbs metaphorically click on above my students’ heads. I also love when I can feel my own light up because I learned something new. Engaging in education is a euphoric sensation that I hope never dissipates. So the next time you find yourself searching for a new style via pintrest or a hash tag that is all the rage, why not settle in your stylist’s chair and ask THEM what is new. Chances are we have something in mind that we just learned and we’ve been saving it for you.